There are a few times every year that I get really homesick for my parents cooking. Malaysian Curry Chicken, Chicken Satay with peanut sauce and also Laksa are the dishes that make me think of warmer climates and amazing family. Although I’m blessed with only living ten minutes away from my mom and dad, and only work a stones’ throw away from our Chinatown….midnight cravings of some great authentic street-style hawker food are always present. Since I was born here in Canada, I really was lucky enough to be brought up eating tasty authentic dishes from my parents Malaysian-Chinese heritage, alongside western dishes such as pizza, fried chicken and our fast food favorites from Rotten Ronnies. However, even home cooked versions of street food are not quite the same. The weather is not as hot and humid, the ambience is all wrong, the ingredients slightly different and there are no shared tables with random strangers or people squatting in large outdoor markets filled with street food vendors. If you ever get a chance to visit Asia, you need to see this first hand. Seriously! 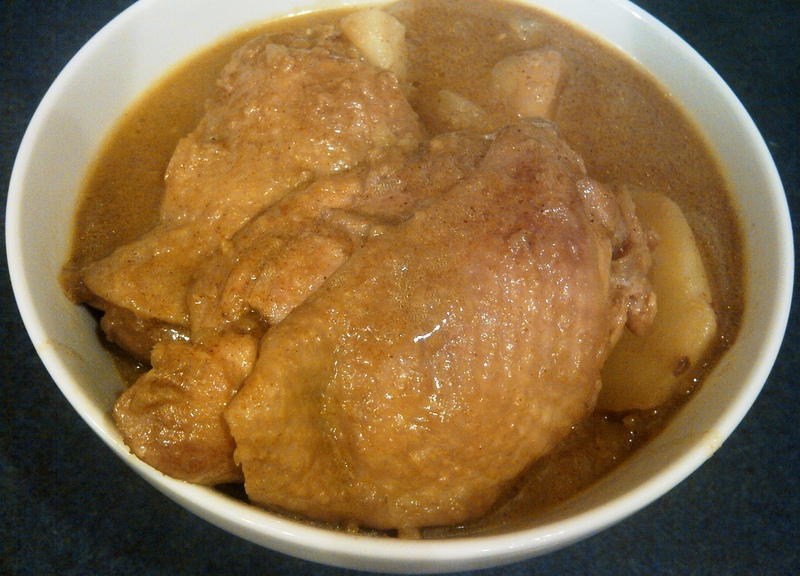 Dear readers, I do apologize in advance for the long list of ingredients for this tasty rendition of Malaysian Curry Chicken – but I promise you that it is so worth it. The difference in my version of this dish and my parents version is that the curry powder they use is an old family recipe that I JUST finally got my greedy little paws on…and really, I honestly can’t give it to you. 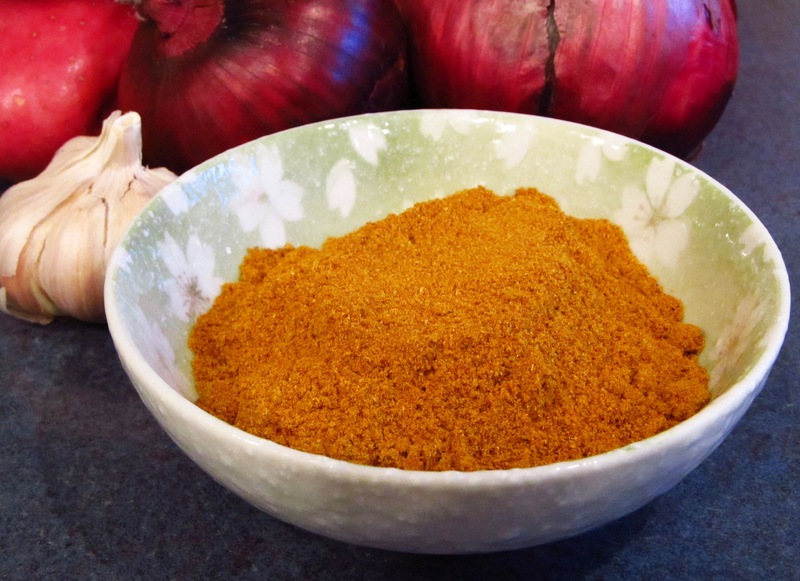 I have waited my entire life for this secret curry powder recipe and I would have to seriously ensure that you wouldn’t share it. Which I can’t really enforce without getting into some trouble with the law ~ I’m sure that the food behind bars is not a good fit for foodies. This curry spice mix is super tasty though…and you’ll have enough for at least a few more meals. It works with all sorts of meat, but I prefer it on chicken. The last time I made this, I even had the neighbours on both sides peering over the fence and exclaiming “Wow, that sure smells delicious!”. 1. Over medium heat, toast first 11 ingredients in a wok or skillet for about 5 minutes or until fragrant. Stir constantly to ensure that the spices do not burn. 2. Cool slightly and transfer to spice grinder (or mortle and pestle). Grind until it becomes a fine powder. 3. Mix in turmeric and transfer to an air tight glass jar (spice mix should keep fresh for up to six months). 4. 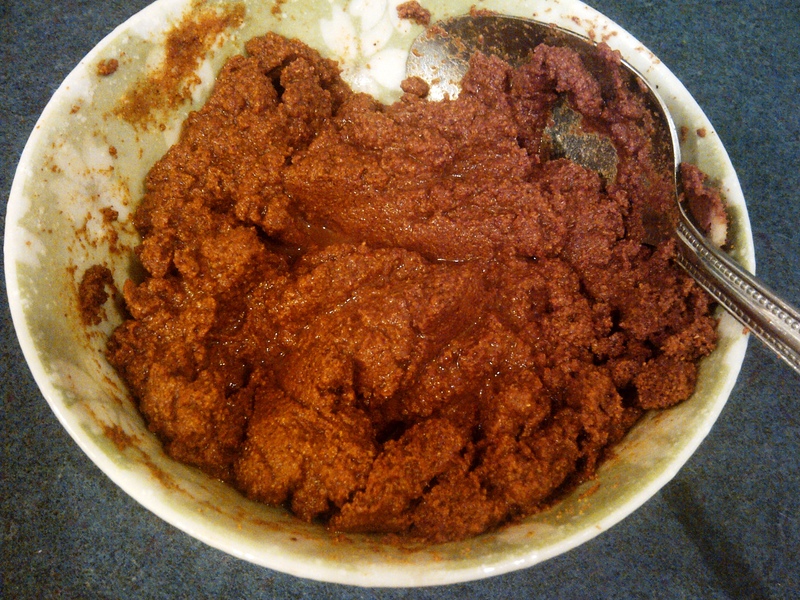 In a blender/food processor, grind the onion, garlic and ginger into a paste. 5. 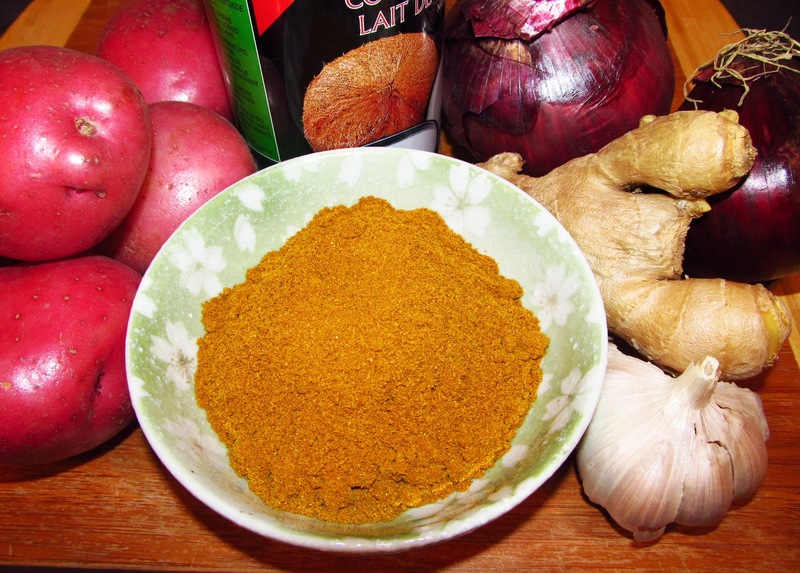 Combine the Malaysian curry powder and red chili powder in a small bowl. Add a few tablespoons of water and mix into thick paste. 6. Heat oil in pot over high heat. Add onion, garlic and ginger paste. Fry until translucent. 7. Add spice paste, and reduce pot to low heat. Fry until oil starts to ooze from the paste. Don’t allow the paste to burn! 8. Adjust heat to medium high and add the chicken pieces. Stir to coat with the curry paste. 9. Add coconut milk and water. Season with salt and stir well. 10. Bring to a boil, reduce the heat to medium and simmer covered for 20-25 minutes. Stir occasionally. 11. 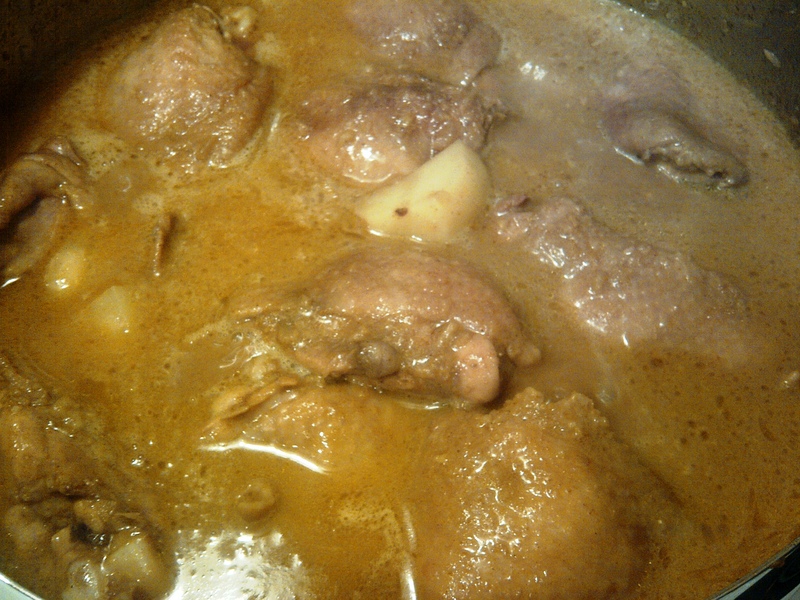 Add potatoes and simmer uncovered for 10-15 minutes or until the potatoes are cooked through and the chicken is tender. 12. Take off heat. Skim off any excess oil on surface of curry. 13. Serve with steamed rice.